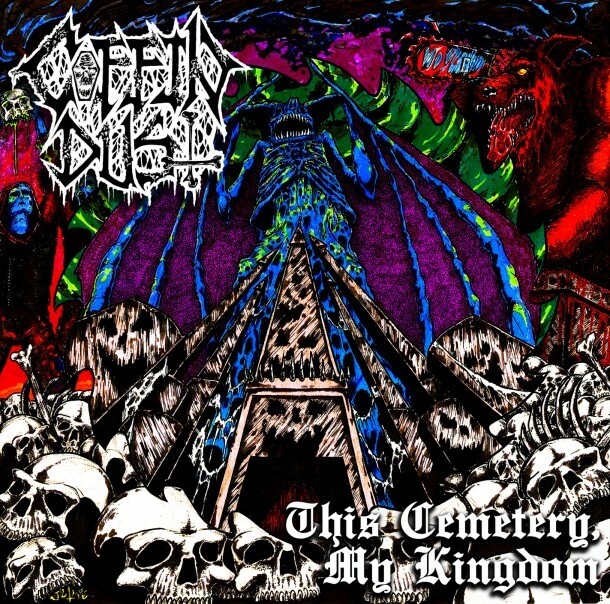 This Cemetery, My Kingdom is the debut release from Coffin Dust, an old school death metal styled band that throw crossover thrash elements into the mixture. Coffin Dust manage to conjure up interesting riffs despite the death revival movement having reached its obvious over-saturation point by now, which is telling of the band’s ability to write good music. The band has a pretty heavy grave theme running throughout this album and the band achieves a sound that invokes similar imagery musically, with deep crunching bass and heavy, bass-y rhythm guitars which provides a strong backing for the interesting lead guitar work to occur, most notably on the songs Crack Open A Cold One and the creepy tinged leads on Mary Jane Rotten Crotch. The riffs exude a very death/thrash style tinged with crossover thrash at some parts, Pig Roast and Saw Wolf, although the crossover thrash aspect has been stripped back from their EP and two splits, leaving a more straight forward death/thrash album. The vocals are deep and contain just the right amount of brutal death gurgle to really emphasis the decayed themes of the album without seeming ridiculous and are served with a solid set of layered higher vocals at sections. The drumming is solid and provides a strong backing for the album while not drowning the other instruments out. The 12 songs vary in length from the 3 shorter tracks all just breaching less than 2 minutes with the remainder spread out from 3 to 7 minutes, and the titular song ending the album with a fairly lengthy 8 minute track, leaving the album with almost an hour’s runtime. Despite the death/thrash, and the death revival in general, being quite played out by now, Coffin Dust do the genre justice with This Cemetery… by playing some solid death/thrash with interesting riffs and lead work. Strong debut album and a strong album in general.